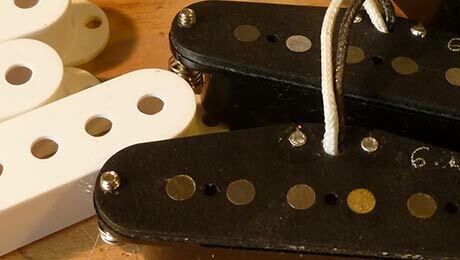 Compare Bare Knuckle Apache and Tonerider Pure Vintage Strat pickups in an audio bakeoff. Maybe I should call it Eliza? The new 'fat' guitar is being groomed. She's slowly learning how to tame her wild spirit and how to behave in polite society. I've been asked a couple of times now for help with the wiring of the Dan Armstrong (London) sliding pickup guitar. What does ‘fat’ sound like? OK - I haven't posted in nearly a year, but what better way to start blogging again than to announce a new album that I wrote for, played and sang on. At the last step in the Dan Armstrong refinish, and everything goes pear-shaped. Just my luck. My lonely Dan Armstrong guitar finally finds a long lost relative, and although my Dan is the feisty younger sibling they still share the same terrible flaw. The Dan Armstrong (London) refinish continues, but stripping away the years reveals a couple of worrying littles. I've decided to revive my Dan Armstrong (London) guitar. But as I strip away the years of detritus, I’m suddenly puzzled. When was it really made?